These plastics can be re-heated and re-shaped in various ways. They become mouldable after reheating as they do not undergo significant chemical change. Reheating and shaping can be repeated. The bond between the molecules is weak and becomes weaker when reheated, allowing reshaping. These types of plastics can be recycled. Acrylic. (Known also as PERSPEX) This is the most common plastic in a school workshop. Purchased in the form of sheets and comes in a range of colours. It can be translucent (e.g. smoked), transparent or opaque. It is resistant to most acids and weather conditions. Easy to cut shape. Polishes well. LDPE - Low Density Polythene is tough and flexible. Softer than HDPE. Can be moulded into almost any form. Flexible, comes in range of colours. 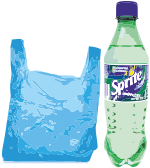 Bottles and plastic bags are made from the low density polystyrene. HDPE - High Density Polythene which is rigid and hard. Less flexible than LDPE. Machine parts, bowls and crates are generally made from high density polystyrene. Polypropylene (PP) is a thermoplastic often formed into products through injection and blow moulding. It is robust, strong, flexible and supplied in a range of colours. Food containers, chairs, packaging and storage units. Polyvinyl Chloride. Better known as PVC. A tough material, purchased as either a hard (inflexible) material or alternatively a flexible form. It can be extruded, welded or bonded with an adhesive. Range of uses including water pipes, raincoats, long play records, coating on electrical wires and packaging. Gears, bearings, wheels and clothing. Light material and yet strong. Available in a range of colours. Can be vacuum formed. Thinner HIPS is quite flexible. 1. Complete the paragraph on thermoplastics, by adding the missing words. These plastics can be re-heated and ___-_______in various ways. They become mouldable after __________ as they do not undergo significant _________ change. Reheating and shaping can be repeated. The bond between the molecules is weak and ________ _______ when reheated, allowing reshaping. These types of plastics can be _________. 2. Acrylic, aslo known as perspex is used widely in schools. Why is this? 3. What is the difference between LDPE Low Density Polythene and HDPE High Density Polythene? 4. What is the name of the main industrial process, through which Polypropylene (PP) is processed into products? 5. Name four products that are often manufactured from Polypropylene (PP). 6. Write the full name of the material also called PVC. 8. Why is Nylon often used in engineering?